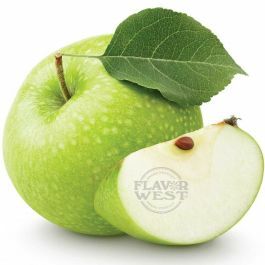 Green apple flavor is a perfectly blended tartness of apple that creates a refreshing variation of drinks, beverages and baked treats. Type: Green Apple Water Soluble Flavoring. Ingredients: Natural and Artificial Flavoring, Propylene Glycol and Ethanol. USP Kosher Grade Flavoring. Usage Rate: 15-20% for E-use. Flavor Suitability: Drinks and beverages, smoothie, desserts, pastries, baked treats and more. Specific Gravity: 1.03 No Refunds on Flavoring. One of the FIRST and BEST flavors I tried when I started vaping long ago! Smells and tastes FANTASTIC! Kind of like a Jolly Rancher but even BETTER! Mixes nicely with Sour or Caramel Candy! Give it a try! This is a favorite among my friends. A good one for sure. I personally didn't find this one to be good enough by itself. But I also have a sweet tooth, so it could just be me. As a mixer, this is great though.